- Kaolin: Absorbs impurities and slows down their formation. - Rice powder and argan chips: Micronized particles that create a synergy of deep micro peeling (rice) to a surface exfoliation (argan chips). 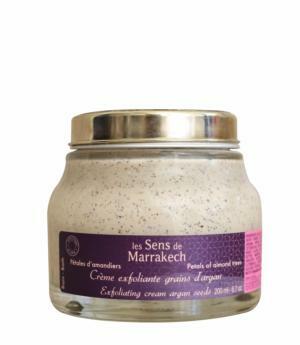 - Butter of argan, mango and shea: Repairers and nourishing. Immediate action and visible effect over the long term. - Argan oil: Soothes and nourishes. 1 to 2 times a week, apply a regular coat on the dry skin body then proceed to scrub by light circular movements until the cream completely stuffed.